It’s interesting that every time I talk about the advantages of compact fluorescent bulbs, I see the same criticisms over and over. Thus, I though I’d spend a bit of time responding to each of them. CFLs produce low quality light. A common criticism is that CFLs produce “low quality” or “off color” light. While I recognize that this is largely a matter of personal preference, I also want to point out that light quality varies widely across brands/models. While I myself have run across a number of bulbs that produce crappy light, others are perfectly acceptable. Before dismissing them entirely, I would recommend investigating this for yourself. Here is a good place to start. While it’s true that CFLs contain a small amount of mercury, it’s also important to keep in mind that roughly half of all electricity in the US comes from coal. And guess what? Coal-fired power generation releases mercury into the atmosphere. In fact, it’s been estimated that CFLs, when mercury emissions due to power generation are accounted for, CFLs are actually “cleaner” than incandescent bulbs. There’s also a lot of concern over what might happen if one breaks in your house, though it’s been argued that these sorts of concerns are overblown. Nonetheless, you should exercise care in disposing of CFLs. CFLs don’t work for all of my needs. While it’s true that many CFLs aren’t compatible with things like dimmer switches and fixtures with three-way switches, technology in this area is continually advancing, and bulbs are available that are appropriate for virtually all applications, including dimmable and three-way bulbs. The main places where CFLs lose a bit of luster is for cold-weather applications. CFLs use more energy when powering up. While this is technically true, the difference between CFLs and incandescent lights in miniscule. 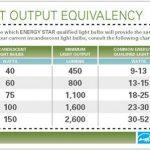 The additional energy draw is so brief that it amounts to the equivalent of a few additional seconds of bulb operation. From an energy usage perspective, it thus makes sense to turns off CFLs every time you leave the room. However, flipping a CFL on and off too frequently can reduce it’s lifespan. Thus, experts typically suggest turning off your CFLs whenever you’re leaving the room for five or more minutes. Don’t get me wrong, I don’t view CFLs as the perfect solution. In fact, I’m really looking forward to the day when LED lighting hits mainstream. But in the mean time, CFLs are the best solution out there when you consider both bulb cost and energy efficiency. This comments are really helpful. It reduces lot of myths among people around globe. CFL is a wonderful replacement for Incandescent lamp. In my view, following hints might be helpful in future. 1. spending of more time behind public awareness on use of CFL. 2. Consistant work to find another alternatives for CFL in future. Our apartment building switched to CFL bulbs a few years ago and the cut in power consumption came attention of the hydro company. Suddenly our building was using so much less power that they sent someone around to make sure the maintenance people had not rigged the meter. Until a CFL is capable of giving off light as good as, say, a GE Reveal bulb, I don’t forsee using them. The current generation of CFLs take too long to reach full brightness and give off an off color light that gives me headaches (yes, the quality ones). I do have some CFLs in places like the laundry room and hallway, where the light isn’t paramount to quality of life. But they will never been useful in the living room, computer room, or kitchen as long as they produce such poor quality light. Yeah, they do blow out quicker. In general, the lower the voltage the quicker they blow out. The rheostat is probably what’s saving your bulbs. I’m renting, so I really can’t install a rheostat. @ Quinn– That’s strange that the candelabra bulbs in your chandelier-type fixture burn out quickly. Mine last forever. In five years, I’ve changed out three of eight such bulbs. Mine also don’t seem to produce much heat. Possibly try a different brand? Also, my fixture has a rheostat and I never have it turned to full-blast. Possibly try changing out the light switch for a rheostat and turning down the power a little?? It’s not that difficult to determine how heat a light bulb of a given wattage adds to the heat gain for a house. A “Manual J” calculation can be done by many qualified HVAC professionals. Ryan: No, wattage is certainly not temperature. However, it’s what tells you how much heat is getting added to the environment. In both incandescent and fluorescent lights, almost all of the electricity consumed gets turned into heat inside the house. Maybe I’ll try mixing CFLs with my incandescents to see how it looks. I sorta misspoke. Although hydro is the largest source of our electricity, coal is number two (you can thank the greenies for that one!) So you do have a valid point about coal. The whole point about the heating/mercury comment is the possibility that CFLs might provide no advantage in my case, but they would contain more mercury. We don’t air condition here in the Pacific Northwest, we only heat. You bring up another issue. Some people get blinding headaches from the strobing effect of CFLs. I personally don’t, but know that they can exacerbate or even cause migraines in certain people. A CFL mandate would devastate them. The ONE application that I really want CFLs is in the little chandelier above our dining table. It uses 5-40 W candelabra bulbs that die so quickly (less than a year each) and produce too much heat. They have small threads. They’ve got shades, so i think CFLs might work there, if they make them that size that can handle shades. Interesting. I wonder to what extent sensitivity to the quality of CFLs’ light is associated with your age. I changed out as many of my bulbs as I could. I don’t notice a significant difference in the quality of the light. But my son certainly does–he says they make everything look greenish. Twenty years ago, when I would have been in my 40s, my father and his wife discovered fluorescent lamp bulbs and changed theirs out. I thought the effect was just HORRID: ugly ghostly light that made my contacts hurt. They didn’t seem to register any such thing: they swore they couldn’t tell any difference. Maybe as you get older, your eyes are less able to perceive that slight flicker and maybe they’re less sensitive to the difference in the lights’ color? All that notwithstanding, I intend to hoard the little fake candle-shaped lights for my chandelier. I LOVE that chandelier, and by golly, I’m not getting rid of it or sticking ugly stupid-looking little curlicue things in it. Before incandescents go off the market, my garage will have a lifetime stash of those things. On the CFL subject: Does anyone know WHAT makes some lamps blow these bulbs out instantly? An older lamp in my living room murders the things, while other lamps of the same vintage work fine with them. Also, two brand-new El Cheapo ceiling fixtures in the garage–the kind that hold raw incandescent lightbulbs in a closet–did in the CFLs I put in them, after an hour or so of use. Whaa?? Wattage is not equal to temperature. And that heat from the bulbs isn’t circulated around the house like air from the furnace is. Wow, thank you Christopher and Nickel for the advice. =) I will check out the HD for the bulbs and see if they are acceptable to SWMBO. Thanks for the great post. Myth Busters did a great experiment with these. I am sensitive enough to the quality of artificial light that I understand completely why some people are dissatisfied. In fact, in places where I’ll be using the light early in the day (when I’m most sensitive), I’ll only use Lights of America daylight bulbs–I’ve tried several other brands, and none have made the cut. I also rent and have a vanity strip in my bathroom. Some manufacturers (including Lights of America) do make globe bulbs that are essentially regular CFLs with a diffusing covering. I’ve been quite satisfied with the light and, as a bonus, the reduction in heat output (which you can notice if you’re in a small bathroom getting ready for the day). TheMightyQuinn: Your criticisms of quality and flexibility are fair. I can only speak to my personal experience, but the only CFL I’ve ever had go out was one plugged into a faulty electrical system. The other issues you mention are one of the pragmatic reasons I’m against any sort of mandate to use CFLs: As long as customers have a choice of what kind of lights to buy, manufacturers will have an incentive to make lower-power (incandescent) or higher-quality (CFL/LED) bulbs. Victor: Manufacturers are working on this, but it’s an inherent part of why they can make CFLs as small as they can–the “compact” part. Tube-type lights can come on at full intensity because they have an external ballast (electrical converter) that can charge up instantly, but CFLs have an electronic ballast that takes a little while to get warmed up. It’s a tradeoff between initial intensity and startup delay, and consumers generally prefer instant-on bulbs that take a few seconds to brighten. Ryan: Yes, there is a very easy way to figure that out. The power rating of the bulb (e.g., 100W) is almost exactly how much the bulb is heating up the surrounding air. The bulbs contain trace amounts of mercury and it’s nothing to be concerned at unless the bulb breaks. Even it were to break, the amount of mercury will be so small that after opening a window, the trace in the air will be well below any remotely dangerous level. In the 60s and 70s, people played with the stuff! I think the heat concern is negligible as well as the savings on air conditioning. There’s no practical way to figure out how much those incandescents heat up your home. 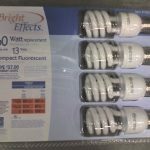 donna jean: During our last move we left our CFLs in place and bought new ones at the new house. This was partly because it was a long distance move, and partly because I figured we might end up converting another family to the wonders of CFLs. Victor: I’ve had good luck with the multi-pack 60W equivalent bulbs from both Home Depot and Lowes. What cfl bulbs are good to get? I have bought some and they all tend to start off with a low-level of light, and eventually get stronger to the level of brightness desired. Are there kinds that start up immediately? I’m often surprised at the criticism for CFL bulbs. I guess they won us over easily ages ago and we haven’t looked back. Are they the perfect solution, nope, but they’ll tied us over as we next look at LED options. When we rented, we had replaced all the bulbs for CFL (except perhaps a few we never used). When we bought out house, I noticed my husband reverse moving containers of light bulbs and couldn’t figure out what he was doing. Then it dawned on me, he was taking all the incandescent light bulbs that were in our new house and switching them out with our CFLs so that we could take them with us. What a great idea. We’ve been using the same bulbs for several years now and only once had one that burned out right away (and we took it back to the store and they replaced it because it was obviously defective). I’m also a light hog and CFLs are a much more economical way for me to get my light-fix in. I will admit that we have one light fixture in our primary living area that we do use an incandescent bulb during the winter because of light needs, but replace it with a CFL in the summer when we don’t need the extra light. So I’m happy with them and look forward to advancements with LED lights as our next step in lighting. Some areas of the country do get most of their electricity from hydroelectric. However as a whole about 50% of the nations electricity is from coal. We have growing demand as a nation and much new electricity is from fossil fuels. WE are not getting new hydroelectic added. If your area increases its electricity usage then that will mean more coal & fossil fuel used. But if you could cut your electricity usage then that would mean your hydro based electricity could be used by someone else and stop the need for more coal based electricity. CFL’s work just fine for me for going on 10 years now. They do not burn out fast, (I didn’t buy cheapo brands) and they save me a LOT of money. The concept of a bulb that saves me money and doesn’t require me to do the work of replacing them very often is quite attractive, but CFLs can be good or bad. I had some craptacular CFLs before, the light came off with a pasty red hue. After I learned a bit a bit about light such as lumens and color temperature, I gave them another go. My CFL story ended happily as I finally got fed up with my old ones, bought some new ones and have been pleased with the results. We use a combination of CFLs and incandescents in our bathroom globe lighting, making sure we keep at least 1 “traditional” incandescent for every 2 CFLs. It keeps the lighting bright and natural-looking while still saving us energy. We use CFLs exclusively in our shower/bath area lighting. In our home we use all CFLs, EXCEPT in areas where my kid studies and reads. He has lousy vision, and headaches triggered by poor, eratic, or flickering light. 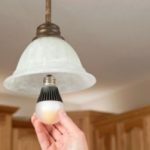 I think those who suffer from certain kinds of seizures and migraines should be VERY careful about using CFLs, because despite massive improvements, they still have flicker, not necessarily visible to the “naked” eye. I began making the switch (ha) about a year ago and I’ve noticed a reduction in our electricity bill. We have 48 recessed can lights in our home and they are a pain to change. I’ve not had to change a single CFL yet and they give more light that the old standard incandescents. What’s not to love. I’m far from an environmentalist but if a technology can save me money and keep me from climbing my 10 ft step ladder (we have 12 ft ceilings), I’m all for it. Maybe someone can answer my concerns, since CFLs don’t seem to be a fit for my home. Yes, they do. I get my electricity mainly from hydroelectric, so the argument about coal doesn’t apply. What compelling reason is there to add mercury to our home? CFLs donâ€™t work for all of my needs. 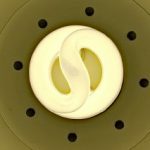 Why are CFLs better? They are more efficient because they dissipate less heat than incandescents, reducing the amount of electricity needed to light your home. But what if I WANT the heat? I live in a cold climate, and we have heaters on 10 months out of the year. Incandescents help to heat our home. Will buying CFLs, then using less electricity for lighting and more money on heating save me money overall? The biggest reason I feel that people are critical of CFLs is that they often don’t last very long. I hear story after story from those who replaced all their bulbs with CFLs, only to have a number of them blow out after a few months to a year. So much for longevity. Even if there is a warranty, it’s still dissappointing. Others complain that CFLs don’t fit into their light enclosures. CFLs haven’t lived up to the hype. Everyone wants them to, but the truth is that they don’t. When CFLs become as versatile as incandescents, that’s when they’ll gain more acceptance. Actually, there are 3-way CFL bulbs available. I saw them at Target. They do cost more – around $11, but 3-way regular bulbs cost more, too. I’ve seen them at equivalents of 25, 50, 100 or 50, 100, 150. I agree. If I could marry my CFL’s I would. We saved $20 a month on our electric bill thanks to these sweethearts. We changed over all our fixtures in the house to CFLs when we moved in two years ago. The previous owners had dimmers in every room, so we swapped out the dimmer switches to get rid of the CFL buzz. It has not only impacted our electric bill, but we also benefit from the lower wattage in this older house. We have a large, extremely well-lit master bathroom which has 12 bulbs on the main light switch, 4 halogen track lights on a second and a ceiling fan (with another 2-bulb light of course) on a 3rd switch. Before we went with the CFLs on the main lights, we couldn’t have all the lights on at the same time or in conjunction with anything else in the bathroom – like a hairdryer, vacuum or space heater – without blowing a fuse. We need to spend the cash to upgrade the electrical to work in this century, but the $50-$60 we spent on CFLs bought us more time to save for the $2500-$3000 electrical upgrade. It took a week or so to get used to the lower-light, but we’ve adjusted and I am glad to say every bulb that we can change has been converted to CFL. I’m part of the board of our HOA. We spent $100 (very cheap at Sam’s Club) changing bulbs in outside areas from incandescent to CFLs. These (about 60) bulbs consume a lot since they’re on for about 12 hrs everyday. We’re saving about $400 a month, compared to the same month last year. What is there not to love!!! I read when on my bed with a CFL. No problem. I’m a lazy greenie – in other words I’m green when its convienant. Recycling goes to the curb where the city pick it up – easy. I mow with an electric mower – way, way too easy – small yard, no oil, gas, no pulling to start. Told you I was lazy. CFLS are wonderful cause they last. I especially like them in hard to reach areas. If it requires a ladder to change the bulb – I get a CFL – the longest lasting one I can find. On the flipside my husband’s car was totalled last year and we went shopping. He’s one of those fools that always buys new. We were looking at Prius’. And finally I determined it would be too hard (and expensive) to own. The technology would be likely to break (that little car was loaded with techological goodies on the inside) and there aren’t many independant hybrid mechanics available yet. I told my husband I just wasn’t ready for the challenges of hybrid driving yet. Michael: Correct. I’m talking about fixtures w/three-way switches. I’m one of those who don’t like CFLs due to the quality of light. We still use CFLs, just not in places where we spend extended periods of time reading or relaxing. They go in the hallways, above the kitchen sink, etc. I looked at the popular mechanics reviews, and it looks like there are some reasonably priced “natural” light bulbs that scored fairly well, but you’re still looking at somewhere between $4-$6 per bulb. Not terrible considering they last longer, but still a bit too pricey to buy and experiment with to hope they don’t hurt my eyes. I’m sure they work fine for most people, but I’m susceptible to eye strain with even the slightest unnatural light. I’m pretty sure that CFLs get along fine with three-way wall switches. If you meant the three-way light fixtures that work with 3-way bulbs (two filaments–one filament on, the other filament on, or both filaments on), then I would agree. I believe three-stage CFLs exist but are more expensive.